The plant’s outer pieces eventually starts to die, after approximately a year. This leaves the plant with only bare, woody stems. Use a combined contact and stomach insecticide, together with a wetting agent – prickly pear bushes have a wax type leaf and whatever you apply will just run off. Top tip: if there are no water restrictions in your area, try and loosen the cochineal with a hose pipe and high pressure nozzle prior to spraying, as the insect burrows deeply into the holes. 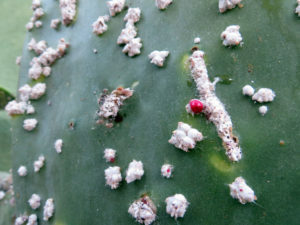 Visit your local GCA Garden Centre for advice on how to treat cochineal infested plants!